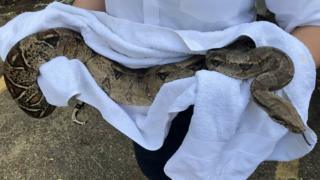 An "abandoned" boa constrictor has been rescued by the RSPCA after it was found in a country park. The 1.5m (59in)-long snake was spotted by a dog walker in a bush at Stockgrove Country Park in Heath and Reach, Bedfordshire, on 31 August. After calling the RSPCA, the dog walker put the snake in a bin to ensure it did not disappear. Kate Wright went to collect the reptile which had a low body temperature, but was otherwise "in good health". After using a hot water bottle to warm the boa, Ms Wright, who is an RSPCA officer, took it to a specialist reptile vet. "Sadly given the location where he was found, it's likely he was abandoned," she said. "I suspect given how cold he was it is likely he had been left in the meadow overnight or even longer." The RSPCA is appealing for anyone with information to contact it.